If funding can be secured, a mural honoring those who have contributed to the FEEF organization aiding local schools is scheduled to be refurbished by its creator, local artist Ameri'ca Jones-Gallaspy. The painting was commissioned in 2002 and was funded by its Board of Directors using a Kresge Development Grant. "The board wanted the community to become more aware of FEEF and decided to ask America Jones to paint a mural in downtown Fairhope at the corner of Church St. and Fairhope Ave. 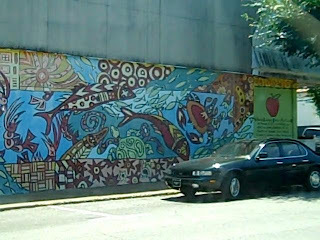 This colorful mural thanks all the community for their support of FEEF and the public schools in Fairhope." Jones said her inspiration for the piece was "the wonderful patterns and stories in australian aboriginal sand art...and the bay!" Current FEEF President Terri Bishop says she is soliciting sponsors to restore the mural, which has become faded and weather-worn over the years. Anyone interested in helping may contact Ms. Bishop or FEEF. Jones-Gallaspy will do the work with help from local high school students according to Bishop. Jones-Gallaspy has also painted a mural on the Manci Antique store in Daphne depicting that city's founding fathers (2009), another one at the Daphne Civic Center -- and created the Mullet Run fountain behind the Fairhope Museum. Store owner Bill Baldwin and his son Brad told the Times recently that they have observed many tourists taking pictures of the popular mural over the years, but have heard some criticism as well concerning its abstract design and bright colors. Some think that something like a more conservative bay scene would be more appropriate there. Baldwin said he personally had no preference and was glad just to get the wall repainted. An informal Times survey found public opinion split abut 50/50 in favor of restoring it, or replacing with something more traditional. Currently, the city has no guidelines concerning the architecture of buildings or how they are painted. An architectural ordinance governing such things has been hotly debated for many years. Awesome. Glad for the redo. Can we add in the flower clock plan? I think we can!!! What is up with Fairhope school supporters. FEEF spending money on this and the Booster club spending $8000 on the puffy, smoke blowing pirate, when classrooms are going without resources like textbooks, copy and print supplies, projector bulbs. Come on Fhope. We can do better. So right! Just like the city of fairhope needs to spend money on road repaving, etc instead of on a stupid flower clock. Use FEEF MONEY FOR EDUCATION! Let the Downtown Merchants pick up the tab on the redo. What happened to the Asst. City Clerk? Heard the Clerk was moved to Electric Dept? Why did Kant do this? Mainly because he does not have the authority to fire the clerk. She serves at the will of the council. Moving the assistant diminishes the ckerk's aufhority and protects the assistant from further harrassment. Whether you like it or don't like it, the mural has NOTHING to do with education. FEEF has become a political organization that has strayed from its mission. this mural is a great work of original art. its content indicates the artistic creativity of the painter. any suggestion that the mural should be more "traditional" suggests that there are some in the area that dont have a clue about art. Temporary Ad Sign Restrictions To Be Relaxed? Updated: More Stop Signs Coming To Manley Road Too?